From Goodreads: Lord of the Flies meets The Ruins in this frightening novel written in the bestselling traditions of Stephen King and Scott Smith. Boy Scouts live by the motto “Be Prepared.” However, nothing can prepare this group of young boys and their scoutmaster for what they encounter on a small, deserted island, as they settle down for a weekend of campfires, merit badges, and survival lessons. Everything changes when a haggard stranger in tattered clothing appears out of nowhere and collapses on the campers’ doorstep. Before the night is through, this stranger will end up infecting one of the troop’s own with a bioengineered horror that’s straight out of their worst nightmares. 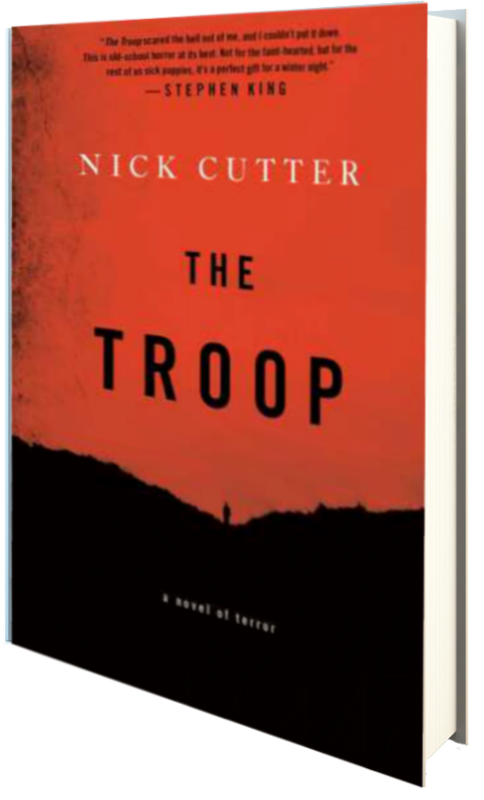 Now stranded on the island with no communication to the outside world, the troop learns to battle much more than the elements, as they are pitted against something nature never intended…and eventually each other. I’m sorry to say that this novel is just not for me. Truth be told, I was not ready for the graphic, nauseating images that are released on readers in this one. Nor was I ready for the awful animal abuse described. This is a very graphic novel, and it made me ill–especially in terms of the worms and the psychotic/sociopathic nature of some of the Troop (Shelley) that is brought to light before everything even begins to go downhill . Things go from bad to worse quickly in this novel, and while it was interesting in the beginning, it ended up making me physically nauseous at times, and turned me into a bit of a hypochondriac as I read. I really enjoyed the concept behind it, but didn’t care for any of the characters–they’re all kind of jerks–and absolutely hated the sections where the lab documented the test subjected on the animals. Wow. Animal abuse is not okay, and I had a really hard time reading a lot of these scenes. For me, the novel wasn’t a scary read by any means—instead, I found it disturbing and, as I’ve said, overly graphic. Because of this, I don’t have a set group I’d recommend this novel to. I enjoyed Lord of the Flies, which is one of the reasons I picked up this novel to begin with (the other was the original cover, but it’s since been changed to this more drab, bloody one), so I can’t say that if you enjoyed The Lord of the Flies, you’ll enjoy this one, but perhaps you will. Just go into this novel knowing that, while very well written, it deals with graphic blood and gore, animal abuse, and disturbing images. Two stars. Gallery, Threshold, Pocket Books has been extremely gracious in allowing me to read an ARC of this novel, via Netgalley, prior to its release on February 25, 2014, in exchange for an honest review. I am just about to read this book, once I finish my current one. I am a little skeptical now. I hope I like it, I do not mind a little bit of graphic detail, but don’t know how I will cope with lots. I was actually really looking forward to this one until I read the reviews. Good luck–perhaps you’ll like it! I just had a lot of reservations with it. I just recently reviewed this one and I know what your talking about. I liked it but I didn’t love it. It was a little bit graphic and Shelley was..well would have grown up to be a serial killer..lol. The worms were very gross indeed..not my way of wanting to lose weight. I didn’t really find it to be scary so for me it was more suspenseful than horror. It is definitely not for everyone.